Multiple scenes of Sherman County, Kansas. 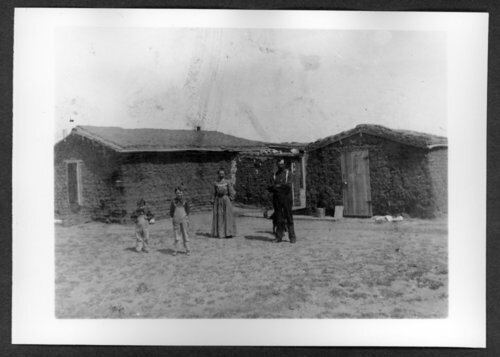 In the photograph of the Wolfrum sod house, pictured left to right: Clifford Clark Eugune Clark, Rachel Wolfrum, Ernest, Kaye, Grandma Wolfrum, George Wolfrum, and Grandpa Wolfrum. Scenes of Sherman County, Kansas - Frank Wright's sod house. Left to right: Raymond Wright, Walter, Carrie, and Frank.